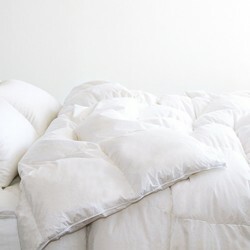 Cuddle Down Products is a Canadian, privately-owned and operated company that has been in the business of manufacturing high quality duvets and pillows since 1975. In the early eighties, they added bed linens to the range. The company imports fine fabrics from Israel, Italy, France, Czech Republic and other countries. They cut and sew all of their linens in the Cuddle Down factory in Ottawa to ensure that you get the finest quality bedding available in Canada.